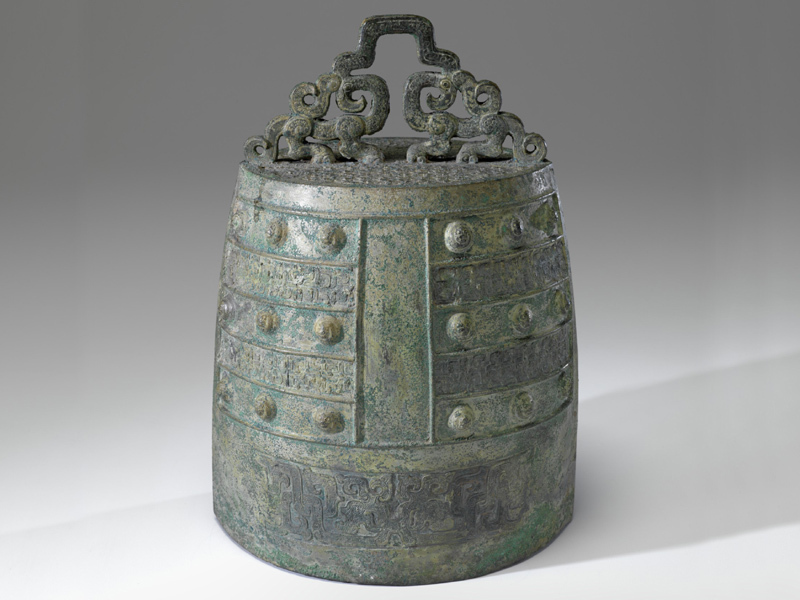 Nearly 3,000 years old, this bell, or niu zhong, was likely once part of larger set of bronze bells, used at ritual ceremonies. These ancient bells are not only appreciated for their beautiful ornamentation, they are also examples of technological mastery. These bells were designed to hang together suspended on a wooden frame, and like other bells from this period, this bell has no clapper. Striking the outside of each bell with a wooden mallet, ancient musicians played the instrument from a sitting or kneeling position. With various inner diameters, heights, and wall thicknesses, the bells produced musical tones. The Chinese developed very sophisticated bronze-casting techniques. The mastery of bronze-casting is seen not only in the intricate designs, but also in the precision of the shape. Most bells were cast already tuned and able to produce two tones. The elliptical shape is very important to the bell’s musical quality and determines the two notes than can be played. For thousands of years music has been an important part of Chinese culture, including religious and public ceremonies, scholarly pursuits, and entertainments. Ancient bronze bells were very important ritual instruments and would have been played in formal events and ceremonies, such as enthronement, sacrifices, and state banquets. The status of these bells is revealed in the elaborate Chinese burials of royalty and high ranking officials, which among other precious objects include sets of bronze bells.